Frauke Petry of AfD leaves a press conference unexpectedly announcing that she won't become a member of the AfD in the Bundestag on the day after the elections, September 25, 2017. NurPhoto/Press Association. All rights reserved.It’s been a funny day in Düsseldorf. The day after an election always feels odd, but this was something different. After Brexit happened, and again after Trump, the city woke up in shock. Last year, on the mornings of June 9 and November 9, everybody at the tram stop was glued to their phones. In fact, public transport on those days was eerily quiet throughout – as though the inhabitants of this prosperous, cosmopolitain city forty minutes down the motorway from Holland and a four hour train-ride from Paris had reached an unspoken decision to tread gently, aware that the ground underneath their feet might not be as solid as they’d always supposed. I’d been expecting September 25 2017 to have a similar hushed quality, but the inner-city rail-link I use to get my protesting toddlers to nursery was buzzing. Nobody seemed to be looking at their phones and nobody – thank goodness – seemed to pay any attention to the aforementioned toddlers. Instead, snatches of feverish conversations – some anxious, some excited – kept spilling over the seats with one word raw and ugly amongst them: AfD. Germany’s far-right immigration party only (only!) got eight percent of the vote in Düsseldorf – five percent below the national average. The local paper, The Rheinische Post, is even claiming that when its reporter showed up to the party’s modest after party, only a dozen or so supporters were there. Contrast that with those ecstatic scenes from Saxony, where the AfD scooped up nearly thirty percent of the vote, and you could forgive Düsseldorf for thinking it had got off lightly. Still, everybody knows that something has changed – even here. You can’t seriously spend eight weeks of your life shopping, working and socialising under posters and giant roadside billboards demanding “more safety for our wives and daughters!” without realising that even Düsseldorf – a city where, until recently, a digital clock counted down the days since it went “debt free” – is not going to be unscathed by the wave of fear and resentment which is unfurling over the country, the continent, and the world. Does that sound melodramatic? Well, I’ve been living under those posters too. One of them is a picture of a typical working-class tenement block with a “no-go” sign in the foreground. Underneath, the words: “if you see this sign, it’s already too late.” Another is a soft-focus shot of young black men doing nothing-very-much, with the words “end asylum cheating now!” in big, bold letters across the middle. I could go on. I finally get the toddlers to their nursery. It’s a wonderful place, as I gushingly tell the bemused-looking nursery teachers when I hand my sticky little treasures over to them. It’s a city-funded institution, one of many set up in recent years as part of Germany’s great “nursery expansion” scheme. The friendly-looking building with the multi-lingual “welcome” signs on the door is hidden away at the end of a cul-de-sac dominated by a sprawling, graffiti-covered warehouse. This is one of Düsseldorf’s poorest boroughs - solidly working class with a high immigrant population. At the last count, there were seventeen different nationalities represented in the nursery including a not-inconsiderable number of children from Syrian refugee families. Everyone gets along brilliantly. At 3 and 18 months respectively, my kids can look forward to several more years of this utopic little social microcosm. At 6, they’ll enter primary school where, at the age of ten, their teacher will then decide whether or not to recommend them for a grammar school where they’ll be able to do the equivalent of A-levels, or one of two types of vocational schools where they won’t. Unsurprisingly, this highly subjective system leads to de-facto social segregation, with grammar schools overwhelmingly populated by the children of white, middle-class Germans. I once heard the Münster-based sociologist Andreas Kemper give a talk in which he described this process as a “systematic weeding out of the working class” and the key factor in the growth of the AfD. Indeed, Sunday’s election data confirms that education is a more reliable predictor of AfD support than income, with the immigrant-baiting party netting 17 percent of votes amongst people who left school with the equivalent of GCSEs, but only 7 percent amongst voters with university degrees. On the way back from the nursery, I pass forlorn-looking SPD posters. The owl-like face of Martin Schulz beams down from them, promising “the time is now”. It was no-doubt conceived in a spirit of hope back in the days (as recent as this spring) when that slogan sounded like a realistic promise of a Labour-led government rather than – at best – hollow mockery and – at worst – sinister menace. It occurs to me that I know the SPD organiser who probably put them up: he’s a father at the nursery. I bite back the urge to ring him there and then and demand an immediate Corbyn-style reboot of the German Labour Party, starting right here, right now, this minute. To be fair, it may yet be that Martin Schulz himself is thinking along those lines (although I doubt he’ll choose Düsseldorf as his launchpad). He is, at least, determined to lead the party into opposition rather than risk a further hollowing out of politics via another “big coalition” with Merkel’s Christian Democrats. Had he done that, the AfD’s 94 freshly-minted MPs would have found themselves leaders of the opposition and that, in this of all parliaments, is a terrifying thought. By the time I get home again, the AfD’s telegenic leader, Frauke Petry, has announced that she will be leaving the AfD caucus, which, she implies, has become too rightwing for her. The German and international media are relieved: 2017 - so the reasoning now goes – was the AfD’s Austerlitz: a high-point from which, with a bit of economic luck, it may never recover. It’s true that a split between the AfD’s extreme right and the bourgeois neoliberal wing headed by Petry and her partner Markus Pretzell seems inevitable. But splitting is what cells do before they mutate, and we’ve seen the AfD mutate before. Ironically, it was Petry herself who oversaw the first mutation: transforming what was basically a small-time anti-Euro party into a populist anti-immigration party capable of entering into one regional parliament after another, like a stack of dominoes. 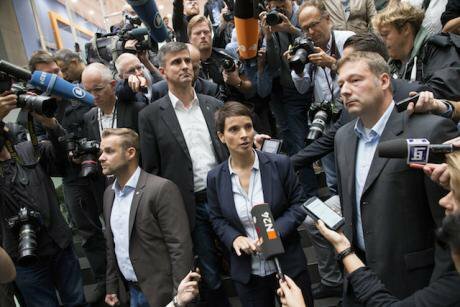 Even before the 2017 election, however, Petry had been sidelined, with the Holocaust-relativising lawyer Alexander Garland and the climate change-denying tax exile Alice Weidel heading the national nominations list. In the wings wait an even more unsavoury cast of ghouls, from Hans-Thomas Tillschneider, who moved his Halle office into the building which houses the headquarters of the white-supremecist Identitarian movement to the 77 year old Wilhelm von Gottberg, who described the Holocaust as a “myth” used to oppress Germany with a “Jewish truth” about the past. The one who really frightens me though is Björn Höcke, the former history teacher who made headlines back in January when he called for a 180 degree u-turn in the way in which the Holocaust is remembered. Höcke’s known to be quick to reach for his lawyers, but to date he’s still made no attempt to sue sociologist Andreas Kemper, who’s made a compelling case linking him to the pseudonym “Landolf Ladig”, under which he is thought to written openly fascist opinion pieces in neo-Nazi publications. “Höcke, Höcke, Höcke” they shout at AfD rallies… and sometimes even “Heil, Höcke”. So yes, as German political heavy-weight Sigmar Gabriel put it, for the first time since 1945, Nazis are entering the German parliament. Worse than that, they’re entering it as the third strongest party. And yes, we should all be very scared.